A recent market study published by the company – “bioabsorbable implants: Global Industry Analysis 2013 – 2017 and Forecast 2018 – 2028,” consists of a comprehensive assessment of the most important market dynamics. By conducting thorough research on the historical as well as current growth parameters of the bioabsorbable implants market, the growth prospects of the market are obtained with maximum precision. The report features unique and salient factors that may have a huge impact on the development of the bioabsorbable implants market during the forecast period. It can help the players to modify their manufacturing and marketing strategies to envisage maximum growth in bioabsorbable implants in the upcoming years. The report provides detailed information about the current and future growth prospects of the bioabsorbable implants market in the most comprehensive way for better understanding of the readers. The report commences with the executive summary of the bioabsorbable implants market, which includes the summary of key findings and statistics of the market. It also includes the market value (US$ million) estimates of the leading segments of the bioabsorbable implants market. Readers can find detailed taxonomy and the definition of the bioabsorbable implants market in this chapter, which helps understand the basic information about the bioabsorbable implants. This section also highlights the inclusions and exclusions, which help the reader understand the scope of the bioabsorbable implants market report. This section explains the bioabsorbable implants market key trends. This chapter highlights the key success factors of the bioabsorbable implants market report, which include regulatory scenario, reimbursement scenario, and list of key manufacturers. This section highlights the average price of Portable bioabsorbable implants, Hand Held bioabsorbable implants, in different regions throughout the globe. The pricing benchmark for manufacturer level pricing and distributor level pricing is analysed in this section. This section explains the global market value analysis and forecast for the bioabsorbable implants market between the forecast periods of 2013-2028. This chapter explains the key macro-economic factors that are expected to influence the growth of the bioabsorbable implants market over the forecast period. Along with macroeconomic factors, this section also highlights the opportunity analysis for the bioabsorbable implants market. This chapter also highlights the key market dynamics of the bioabsorbable implants market, which include the drivers, restraints, and trends. Moreover, readers will understand the key trends followed by the leading manufacturers in the bioabsorbable implants market. Based on the product type, the bioabsorbable implants market is segmented into Stents, Biologic meshes, and fixation Devices. In this chapter, readers can find information about the key trends and developments in the bioabsorbable implants market and market attractive analysis based on the type of products. Based on the Material type, the bioabsorbable implants market is segmented into Metallic, Ceramic, and polymers. In this chapter, the readers can find information about the key trends and developments in the bioabsorbable implants market and market attractive analysis based on material Type. Based on the Application, the bioabsorbable implants market is segmented into cardiovascular, orthopedics, cosmetic surgery, general surgery, cranial surgery and others which includes Ophthalmology, Maxillofacial Surgery, Dental surgeries. In this chapter, the readers can find information about the key trends and developments in the bioabsorbable implants market and market attractive analysis based on application. Based on the end user, the bioabsorbable implants market is segmented into hospitals, specialty Clinics, and ambulatory surgical centers .In this chapter, the readers can find information about the key trends and developments in the bioabsorbable implants market and market attractive analysis based on end user. This chapter explains how the bioabsorbable implants market will grow across various geographic regions such as North America, Latin America, Europe, South Asia, East Asia, Oceania, and Middle East & Africa (MEA). This chapter includes a detailed analysis of the growth of the North American bioabsorbable implants market along with a country-wise assessment including the U.S. and Canada. Readers can also find market growth based on product type, material type, applications, end user and country for the bioabsorbable implants market in North America. This chapter contains a snapshot of the Latin America bioabsorbable implants market. It includes the growth prospects of the bioabsorbable implants market in the leading LATAM countries such as Brazil, Mexico, and the rest of the Latin America region. The important growth prospects of the bioabsorbable implants market based on its product type, Material Type and end user in several European countries, such as the U.K., Germany, France, Italy Spain, Russia, and the rest of Europe, is included in this chapter. India, Indonesia, Thailand, and Malaysia are the leading countries in the South Asia region that are the prime subjects of assessment to obtain the growth prospects of the South Asia bioabsorbable implants market in this chapter. Readers can find detailed information about the growth parameters of the South Asia bioabsorbable implants market during the period 2018-2028. This chapter highlights the growth of the bioabsorbable implants market in the East Asia by focusing on China, Japan, and South Korea. This section also helps readers understand the key factors that are responsible for the growth of the bioabsorbable implants market in East Asia. Readers can find important factors that can significantly impact the growth of the bioabsorbable implants market in Australia and New Zealand during the forecast period based on the market segmentation. This chapter provides information about the growth of the bioabsorbable implants market in the major countries of the MEA region, such as GCC Countries, Northern Africa, Turkey, and South Africa, during the period 2018-2028. Readers can find important factors that can significantly impact the growth of the bioabsorbable implants Market in emerging countries like China, Russia, and Brazil during the forecast period based on the market segmentation. In this chapter, readers can find a comprehensive list of all the leading manufacturers in the bioabsorbable implants market, along with detailed information about each company, which includes the company overview, revenue shares, strategic overview, and recent company developments. Some of the players featured in the bioabsorbable implants market report are bioabsorbable implants Market report are Boston Scientific Corporation, Johnson & Johnson (DePuy Synthes ), Medtronic Plc, Smith & Nephew Plc, Stryker Corporation, Zimmer Biomet, KARL STORZ, OSSIO, Dentsply Sirona, CONMED Corporation, Meril Life Sciences Pvt. Ltd. This chapter helps readers understand the research methodology followed to obtain various conclusions and important qualitative information & quantitative information about the bioabsorbable implants market. A tremendous influence has been created with the continuous innovations by the healthcare professionals in the healthcare industry. Increasing geriatric population suffering from bone fractures are increasing the need for the growth of bioabsorbable implants market. The bioabsorbable implants will reduce the need of second surgery which is required in the case of metallic implants. Road accidents make a significant portion of the worldwide burden of orthopedic injuries moreover in athletics, traumatic injuries to the extremities are very common. Increasing number of sports-related injuries and road accidents are increasing the number of trauma cases thereby, propelling the demand for orthopedic bioabsorbable implants. The bioabsorbable implants have a wide range of indications from ocular implants to fixations of the bone grafts. Technological advancement is expected to be one of the major factor driving the growth of the global bioabsorbable implants market. The manufacturers such as Stryker has developed a new bioabsorbable implant SonicAnchor which is used for Suture and Tissue Fixation the implant works by utilizing ultrasonic energy to liquefy and flow into cancellous bone for stable fixation. The device is available for suture or tissue fixation in ankle, foot, knee, wrist, hand, and elbow and shoulder open procedures. The manufacturers are following combination of techniques to further improve the treatment for patients. Approximately 260,000 Americans suffer from ankle fracture each year, and about 25% require surgery, bioabsorbable implants have made the surgeries easy by reducing the risk of graft damage. Also no permanent metal or hardware is left in the body which further reduces the risk of migration and stress shielding. Innovative methods such as 3D printing can be useful in future for the treatment of breast cancers which involves 3D printing of an absorbable shell-like structure that can safely contain injected fatty tissues. Increasing number of cancer and attribution for improvement in the treatment and detection will bring business to the market and increase the demand for bioabsorbable implants. The competition section of the report features profiles of key players operating in the bioabsorbable implants market based on their market shares, product offerings, differential strategies, company dashboard and marketing approach. Some of the key players featured in the bioabsorbable implants Market report are Boston Scientific Corporation, Johnson & Johnson (DePuy Synthes), Medtronic Plc, Smith & Nephew plc, Stryker Corporation, KARL STORZ, OSSIO, and many more. The key manufacturers of bioabsorbable implants Market are focusing on new product launches and collaborating with other companies to increase their product portfolio and to broaden their product penetration and their geographical footprint in the global bioabsorbable implants Market. Bioabsorbable implants are the ones which absorb in the body. Bioresorbable materials used for the implants slowly diffuse in the human body, such that a second surgery to remove the synthetic material is not required. The materials used in the bioabsorbable implants can be synthetic and natural. The natural material which are used for the bioabsrobable implants are bovine and porcine. While the synthetic materials can be absorbable or non-absorbable. Bioabsorbable implants has expanded the number of surgeons in the field of sports. Plates, suture anchors, screws, and fracture fixation implants are commonly used implants for shoulder surgery and fracture care. The wide usage in the orthopedic surgery is increasing the bioabsiorbable implants market worldwide. The material used in the bioabsorbable implants allows the newly formed tissue to grow into any surface irregularity. Thus, an ideal bioabsorbable implant is free from mutagenic and toxic effects. Also the biodegradation of the bioabsorbable implant depends on various factors such as its contact with the body fluids, motion, temperature, molecular weight and the tissue which is implanted. The company conducted a research study on bioabsorbable implants Market for the forecast period 2018 to 2028. 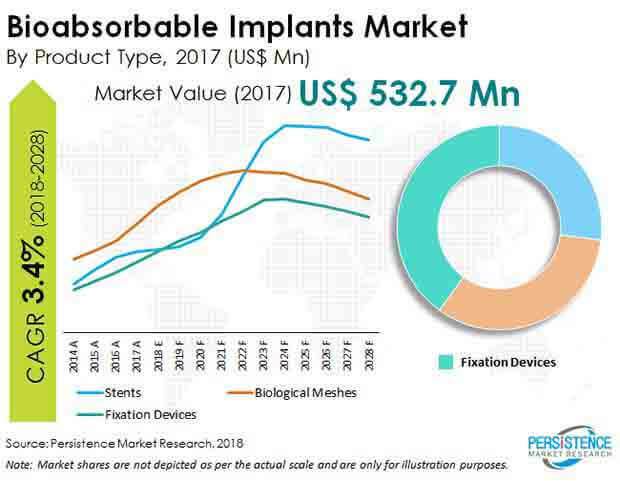 The bioabsorbable implants Market report offers a comprehensive interpretation of the business opportunities predominating the bioabsorbable implants Market along with insights on the bioabsorbable implants Market pricing impact analysis, regulatory scenario, and consumer adoption process, iceberg analysis, and competition blueprint for bioabsorbable implants Market. The report also explains the macroeconomic factors which are responsible for creating and affecting the dynamics of bioabsorbable implants Market and its futuristic potential. The bioabsorbable implants Market report offers a comprehensive taxonomy of bioabsorbable implants Market based on product type, material type, applications, end users and region. The bioabsorbable implants Market are used in many applications such as cardiovascular in the form of stents, screws and pins are used in orthopedics for the treatment of fractures and ankle surgeries, also the implants are used in the form of mesh for the treatment of hernia and Pelvic organ prolapse (POP). The End User of bioabsorbable implants Market are hospitals, specialty clinics, and ambulatory surgical centers. Based on product type, the global bioabsorbable implants Market is segmented into stents, biological meshes, and fixation devices which include various types of coronary, peripheral artery stents and non-vascular stents, natural and synthetic meshes and plates’ pins and screws respectively. Moreover bioabsorbable implants have been segmented based on the type of material such as polymers which include PLA, PGA and co-polymers, metallic implants such as absorbable magnesium alloy implants. The bioabsorbable implants Market has been analyzed across regions of North America, Latin America, Europe, East Asia, South Asia, Oceania, and Middle East & Africa (MEA). What is the revenue potential of bioabsorbable implants Market across regions of North America and Europe? Who are the key competitors in bioabsorbable implants Market and what are their portfolios in bioabsorbable implants Market? What are major challenges influencing the growth of bioabsorbable implants Market? Meryl Life Sciences Pvt. Ltd.